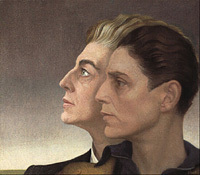 One of her most distinctive paintings is Medallion (also known as the You/We picture), a 1937 dual portrait of Gluck and Gluck’s lover Nesta Obermer. Medallion presents Gluck and her lover in profile, one slightly behind the other, facing the same way, with short hair brushed off their foreheads and behind their ears. The portrait is justly famous as a paradigmatic representation of a female couple’s ‘marriage’, as Gluck called it. It also shows Gluck’s attachment to her manly look. She continued to wear men’s clothes publicly throughout the 1920s, suggesting less a lesbian persona than an artistic one. “I just don’t like women’s clothes.” Gluck said, “I don’t object to them on other women . .. but for myself, I won’t have them. . .. I’ve experienced the freedom of men’s attire, and now it would be impossible for me to live in skirts.” It is justified to believe then, that for Gluck, wearing men’s clothes was more about the feeling of freedom or emancipation from restrictive socials codes relating to women. Therefore, “Gluck took exceptional offense that some of the double takes she received on the street came from so-called Modern Girls – the artist believed that because she did not object to their short skirts, they should not object to her outfit; Gluck saw her own project as continuous with that of the Modern Girl.” (Laura Doan, ‘Passing Fashions: Reading Female Masculinities in the 1920s’, Feminist Studies, Vol. 24, No. 3, Autumn, 1998).